HIIT: what is it - and is it really the best fat burning workout? 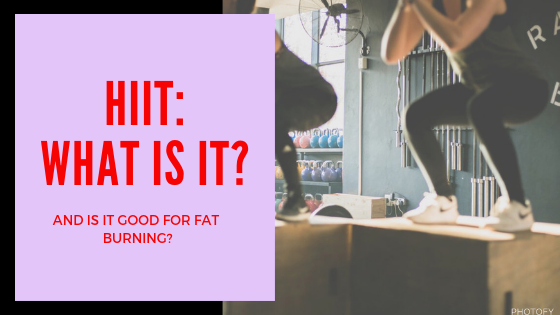 If you’re a fan or follower of the fitness industry, and it’s ever-changing trends, you’ve probably heard of the benefits of HIIT - High Intensity Interval Training. So, what is HIIT anyway? These type of workouts involve working at an intense effort level for a short period of time followed by short recovery periods and may also include no rest periods as well. There are a few variations of HIIT. You can even apply it to your cardio to make it more HIIT-like. One of my favourite ways to do HIIT is switching between High intensity exercises to lower intensity exercises with no rest in-between. Tabata workouts are another great example of a HIIT style workout. A Tabata session involves 20 seconds of intense all-out effort, followed by 10 seconds of recovery. This is repeated 8 times through for a workout total of 4 minutes only and is said to promote fat loss and increase aerobic power - all in a very short period of time. What’s more is that HIIT workouts are easy to fit in to a busy lifestyle since it doesn’t take a lot of time. AND...they’re portable! You can get an effective workout using minimal or no equipment whatsoever which makes it great for staying in shape while you’re on the road. Does this workout seem a little too good to be true? Let’s find out more in this revealing article on the basics of High Intensity Interval Training, including whether it lives up to being touted as THE best workout to burn fat!